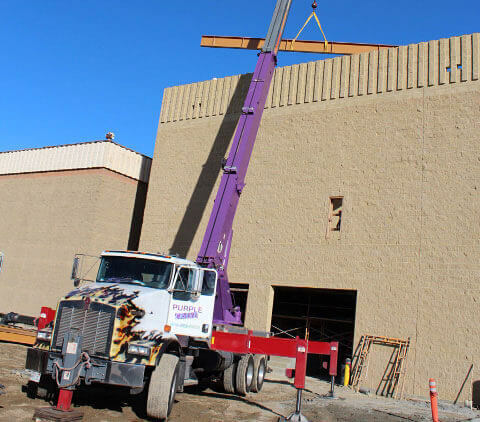 Purple Crane is a family-owned, full-service crane rental company with 30 years of experience assisting Southern California builders, expertly lifting and transporting the materials they need for their projects. We've performed over 75,000 jobs since 1983, and we've lifted and transported a wide range of building materials. Our certified, experienced crane operators are qualified to perform both light- and heavy-duty lifts, and our state-of-the-art cranes range from 3-ton to 75-ton capacity. Our 75-ton crane reaches up to 165 feet, or 12 stories. Knowledgeable sales associates are available by phone 24 hours a day, 7 days a week, and they're standing by to assist you: they'll help determine the best crane for your operation at the most cost-effective price. Our well-maintained, modern cranes are engineered to handle building materials for almost any construction project. We can lift pallets of cinder block, roofing materials, solar panels, lumber, and other large or heavy-duty objects. We also can lift your building materials to and from high floors and roofs. Because we offer truck and trailer rentals, we even can haul your building materials after the lift, whether for transfer to another site or haul-away as scrap. If you need a lift on both sides of the transfer, we can provide a qualified crane operator and crane at both locations. At Purple Crane, we believe in providing high quality service at great value. Call us today to learn more. We are OSHA approved and fully insured, and we can secure same-day certificates of insurance when necessary.